Botanical Name: Astragalus membranaceus, A. propinquus, A. mongholicus. Although more than 2,000 species belong to the genus Astragalus, there are only two related species A. membranaceus and A. mongholicus that are primarily used for health purposes. In Asia, astragalus root has for centuries been regarded as a herb that increases vital energy, boosts immunity and protects the body from illnesses in the same manner as ginseng (Panax ginseng). 1 What is Astragalus Used For? 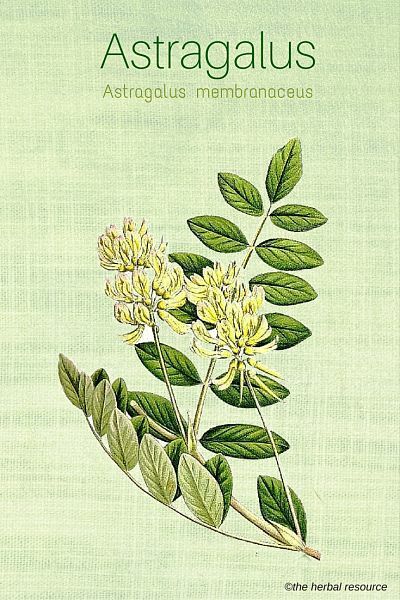 Astragalus is a medicinal herb, and its root is readily available as a herbal supplement in many health stores today. It is used for many conditions, either on its own or in combination with other herbs. Most of its benefits and uses are based on traditional and long medicinal use. Scientific evidence has substantiated some of the herbs application for few conditions, but more studies and clinical trials are needed to understand and confirm its effectiveness fully. The plant is used as an herbal treatment for physical exhaustion and as a general energy tonic, though it is less well-known than ginseng remedies. It is often combined with ginseng to treat general fatigue or fatigue associated with conditions such as chronic fatigue syndrome, infections such as candidiasis and herpes simplex virus, mononucleosis and hypoglycemia. Saponins present in the astragalus root have anti-inflammatory and anti-hypertensive functions. They also make this herb a natural diuretic useful in treating fluid retention disorders including edema. This herb has been used as a natural remedy for prolapsed organs, particularly the uterus. It has been found to be beneficial in cases of uterine bleeding or excessive bleeding during the menstrual cycle. Astragalus has also been used traditionally as an herbal remedy for arthritis, asthma, nervous conditions, Hodgkin’s disease, shortness of breath, persistent infections, fever, some allergies, systemic lupus erythematosus, anemia (when combined with Chinese angelica), kidney disease, hepatitis, stomach ulcers and general digestive disturbances such as gas, bloating and diarrhea. There is considerable research on the herb’s ability to support the body’s immune system, particularly in cancer patients. Astragalus root is regarded to have antiviral and antibacterial properties. It is thought it may stimulate the body to produce interferons, which are proteins that trigger the immune system to respond to a foreign invasion. This herb is therefore sometimes used to enhance the body’s defenses against infection and disease, and it is thought to be useful as a preventative treatment during cold and flu season. This herb contains antioxidants, which may protect cells against damage by free radicals. It has been theorized that the plant’s antioxidants content can make it useful as a treatment (in conjunction with conventional therapy) for people with severe forms of heart disease. 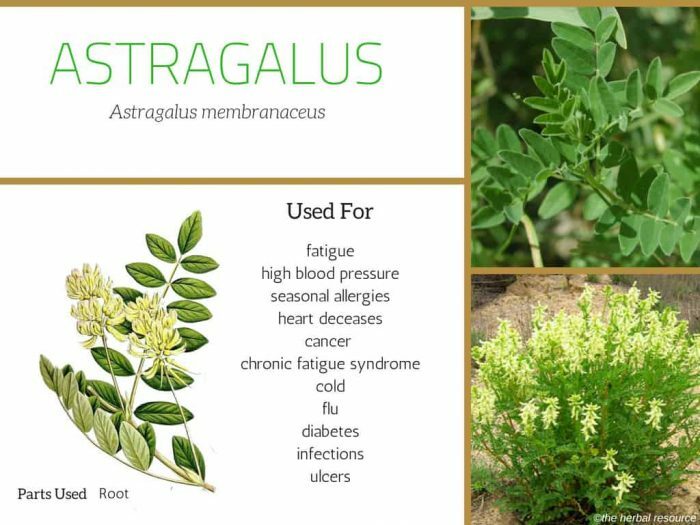 Astragalus contains asparagine, calycosin, formononetin, astragaloside, kumatakenin, sterols, polysaccharides (astragalin I, II and III), saponins (astramembrannin I and II) and Betanin. Alos, the root contains the isoflavones afrormosin, calycosin, formononetin, and odoratin. Standardized products usually contain at least 0.5% of a specific complex of isoflavones. It is mainly the root that is used in herbal medicine, but the above-ground parts of the plant have also been used. The roots are harvested in the autumn (sometimes spring) from, at least, four-year-old plants They are then sliced and dried for later used as powder, tinctures, and extracts. Astragalus root is available as a decoction, tincture, tablets or capsules, topically and even in injectable forms in Asian clinical settings. As a tea: Tea is made from 3 to 6 grams of dried root per 12 oz of water. The mixture should be boiled for five minutes and allowed to steep a further 20 minutes. As a tincture: Prepare tincture in a 1:5 ratio, in 30 percent ethanol and 3-5 mL should be taken three times daily. Make an ointment for topical use with a concentration of 10 percent astragalus. Supplements generally contain 500 mg and two to three tablets, or capsules are usually the recommended daily dosage. The manufacturers’ instructions should always be followed. Astragalus has few side effects at low to moderate doses. Its safety for use among pregnant or nursing women as well as children is unknown so should be avoided. The reported side effects of this medicinal herb include belly bloating, loose stools, low blood pressure and dehydration. This herb does interact with some other herbs and prescription medications, including antihypertensives and immune suppressants. People who have had transplant surgery should not take astragalus due to its immune-boosting effects. 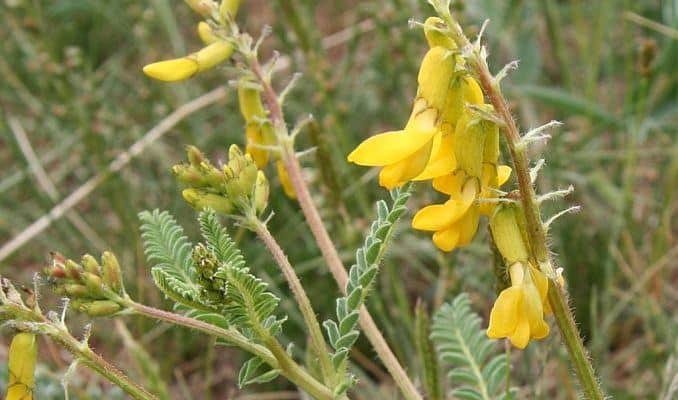 Astragalus may also interfere with blood clotting and should not be taken if on blood-thinning medications. People with autoimmune diseases (e.g., rheumatoid arthritis, lupus, Crohn’s disease, multiple sclerosis, psoriasis and type 1 diabetes) should consult a doctor before using this medicinal herb. This medicinal plant is native to northern and eastern parts of China, as well as Japan, Mongolia, and Korea. It grows along forest margins, on grassy hills and in shrub thickets along hillsides, but it is also found in thin open woods. It thrives in sandy, well-drained soil and full exposure to sunlight. The genus Astragalus is one of the largest groups of flowering plants and belongs to the legume family, Fabaceae (peas and beans). This plant is a twining, multi-branching perennial that reaches 16 to 36 inches in height. The stems are somewhat hairy, and the pinnate leaves are made up of 12 to 18 pairs of elliptical leaflets. Each plant produces three to nine flowers, which give rise to spindle-shaped pods just over an inch long with beaked tips. Astragalus has a long flexible root equivalent in diameter to a forefinger. The root is covered by a tough, wrinkled, yellowish to brown skin, which can break out into many wooly fibers. The root pulp is woody and yellowish to white and has a faint and slightly sweet taste that’s reminiscent of licorice root. Weed, Susun S.: Breast Cancer? Breast Health!. The Wise Woman Way. Woodstock, New York. Ash Tree Publishing 1996. Shirataki Y, Takao M, Yoshida S, Toda S. Antioxidative components isolated from the roots of Astragalus membranaceus Bunge (Astragali Radix). Phytother Res . 1997;11:603-605. Tierra, Michael: The Way of Herbs. New York. Pocket Books 1998. Chopra, Deepak & David Simon: The Chopra Center Herbal Handbook. New York, Three Rivers Press 2000. Foster, Steven and Yue Chongxi: Herbal Emissaries: Bringing Chinese Herbs to the West. Rochester, Vermont. Healing Arts Press 1992. McCaleb, Robert, Evelyn Leigh & Krissta Morien: The Encyclopedia of Popular Herbs. Roseville, California. Prima Health 2000. Mills, Simon & Kerry Bone: Principles and Practice of Phytotherapy. London. England. Churchill Livingstone 2000.